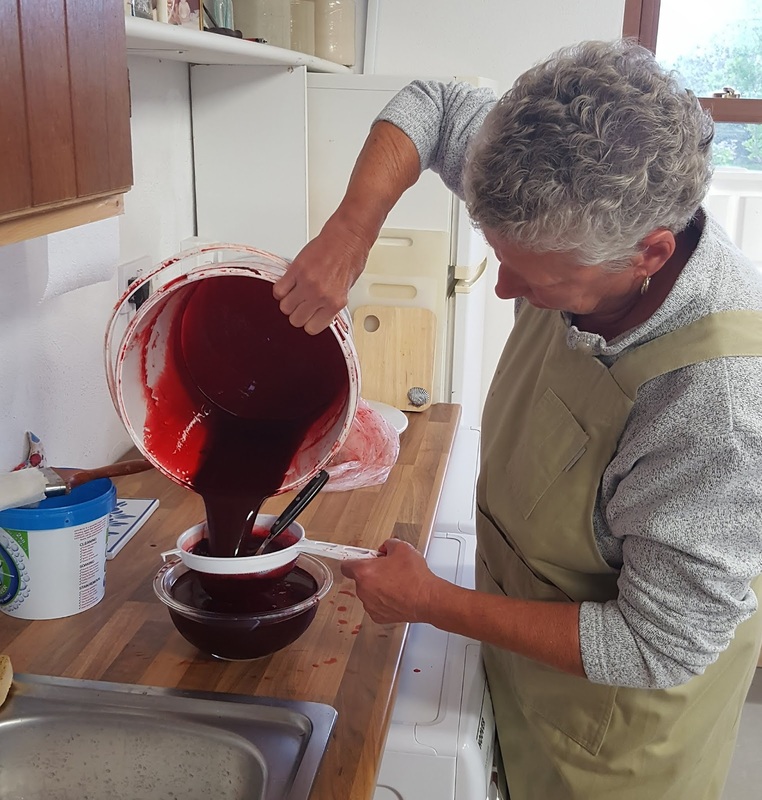 BLOOD PUDDING! 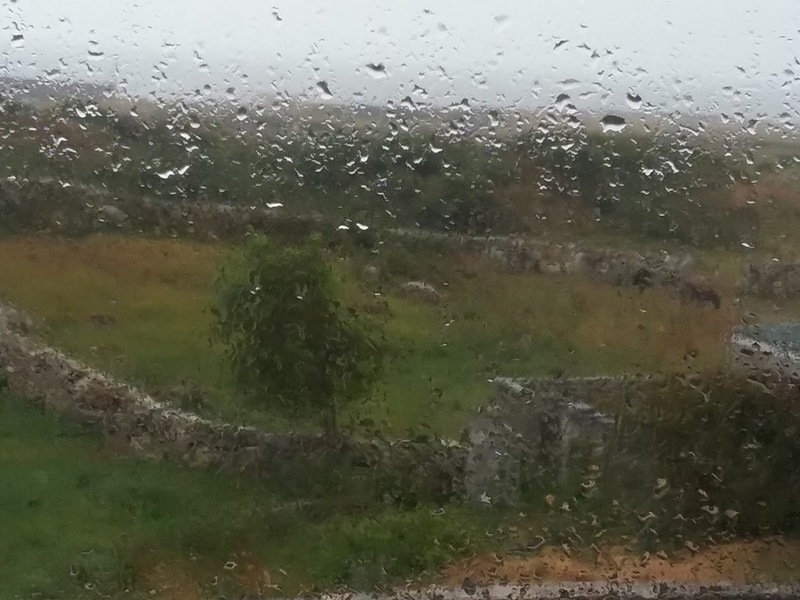 AS IRISH AS IT GETS! Throughout Ireland and the UK blood has been used to make sausage for centuries. 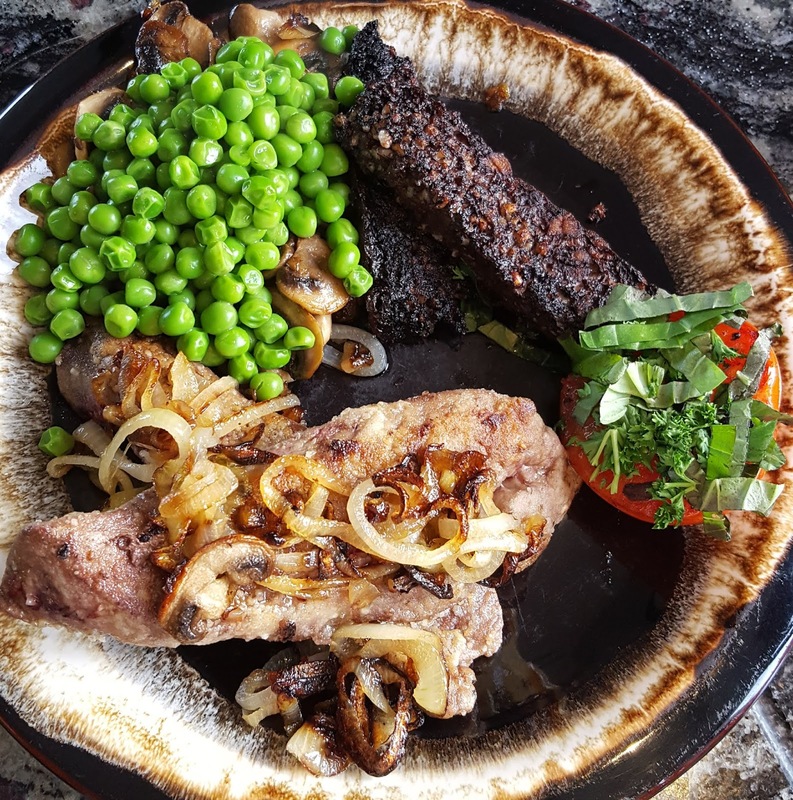 In fact the oldest recorded use of blood for sausage dates back to the 14th century, but Ireland and UK countries are not the only to use this protein rich ingredient. There was a time when we'd utilize every bit of an animal being slaughtered, and throughout the world, blood was no exception. It's in the bag!...the blood, that is. All recipes for Blood Pudding contain roughly the same ingredients, but with many regional spice variations. 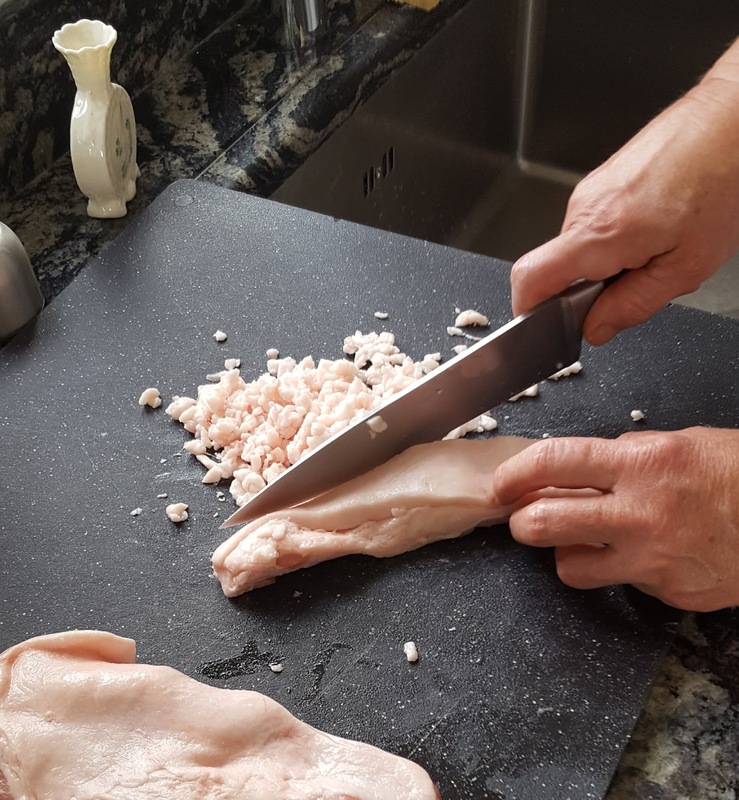 The basics include: blood, grain (oats, barley, or sometimes bread), fat (generally pork fat), salt, pepper and other herbs and spices. Earliest recipes used cow or sheep's blood, but by the 19th century pig's blood was predominantly used. 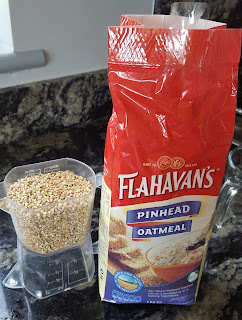 I love Pinhead Oats so used them as the thickener. been cut into 2 or 3 pieces making for a much chewier cereal. This is the 10 liter bucket the blood came in. I'm filtering the blood in our garage kitchen. I've been searching in Ireland for 2 years to find a butcher who would sell me blood. In this country, just as it is in the states, slaughtering of animals is highly regulated and monitored by the government. 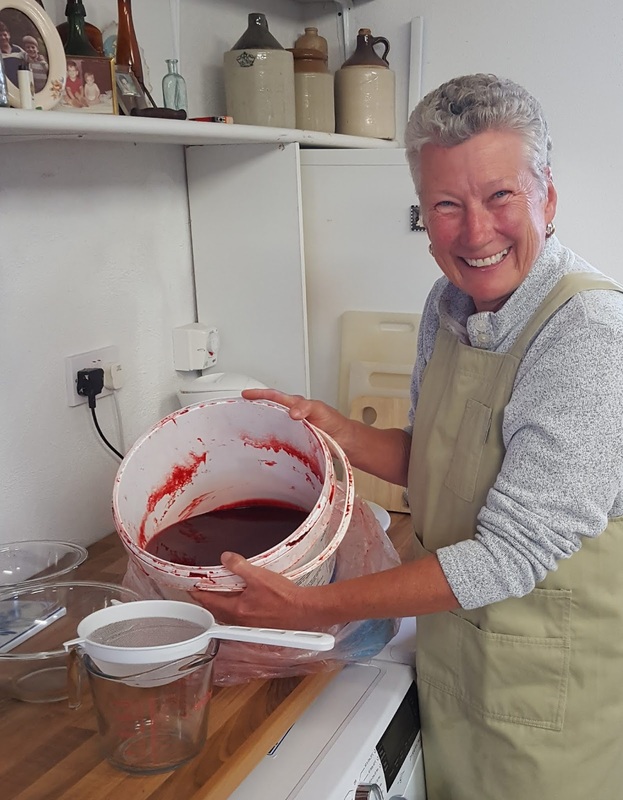 Almost all commercially prepared Blood Pudding is now made with dried blood. I kept expanding my search into more rural areas where I figured they might be a little more lax on the "rules". I found a willing butcher, but have been sworn to keep my source a secret. I asked for 1 qt. of blood, which is what the recipe called for and ended up with 1 gallon plus a quart. That's a lot of blood. To start, the blood needs to be filtered through a fine mesh sieve to remove any impurities and lumps. 2 cups finely diced pork fat or beef suet. I used pork. 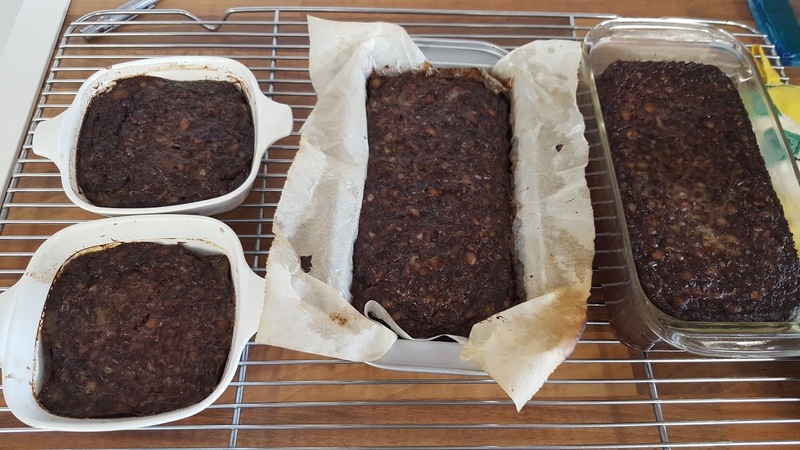 Preheat oven to 325 degrees and grease 3 glass loaf pans. The recipe I used recommended lining a metal pan with parchment if you don't have glass to keep the blood from reacting creating an off-flavor. I had to do this as I don't have 3 Pyrex bread pans, but would not recommend. 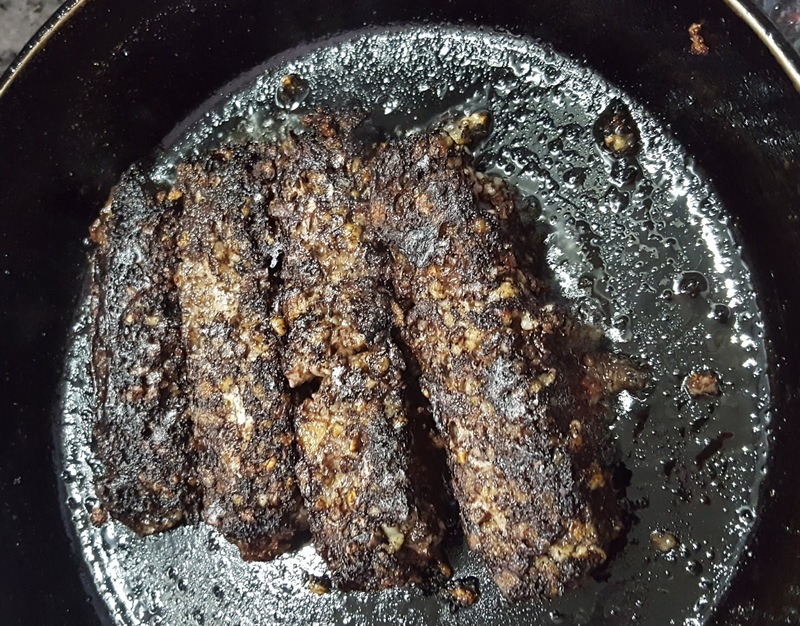 The Blood Pudding seeped behind the paper and made an awful mess of the pan. Solution: buy more pans. Stir 1 tsp. of salt into the blood. Gently saute onions and garlic in olive oil until translucent. Do not brown. Set aside. Bring 2 1/2 cups water to boil and stir in oats. Simmer, stirring occasionally for 15 minutes until oats are just tender, not mushy. 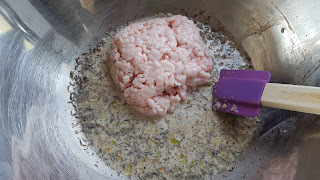 In a large bowl combine finely diced pork fat, onion, garlic, milk, pepper, allspice, thyme and remaining salt. 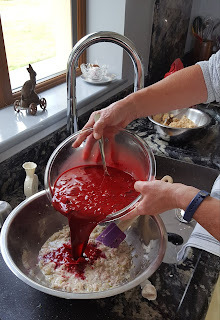 Add the cooked oatmeal and finally the blood. way down to make sure blood stayed fresh overnight. Mix thoroughly and divide between pans. Cover with foil and bake for one hour until firm and a knife comes out clean. 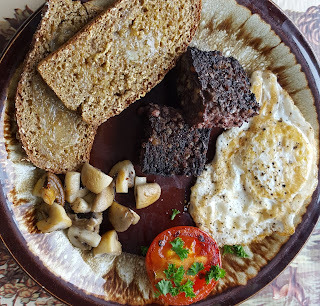 Black Pudding, Blood Sausage to name a couple. Cool completely. To store wrap in plastic. Keeps in fridge for a week. Double wrap in foil to keep in freezer for up to a month. To serve cut 1/2 inch slices off the loaf and fry in butter and/or oil until all sides are crispy. I had already planned lambs liver with onions and mushrooms for dinner that night so just served the Blood Pudding along with it. I've noticed in the finest restaurants in Galway they are now serving as an accompaniment to fish dishes. I had it the other night served with pan fried turbot resting on a bed of cauliflower puree. The Blood Pudding was smoked, which gave it an amazingly exotic flavor. Since I have a new smoker I'll have to try that next. 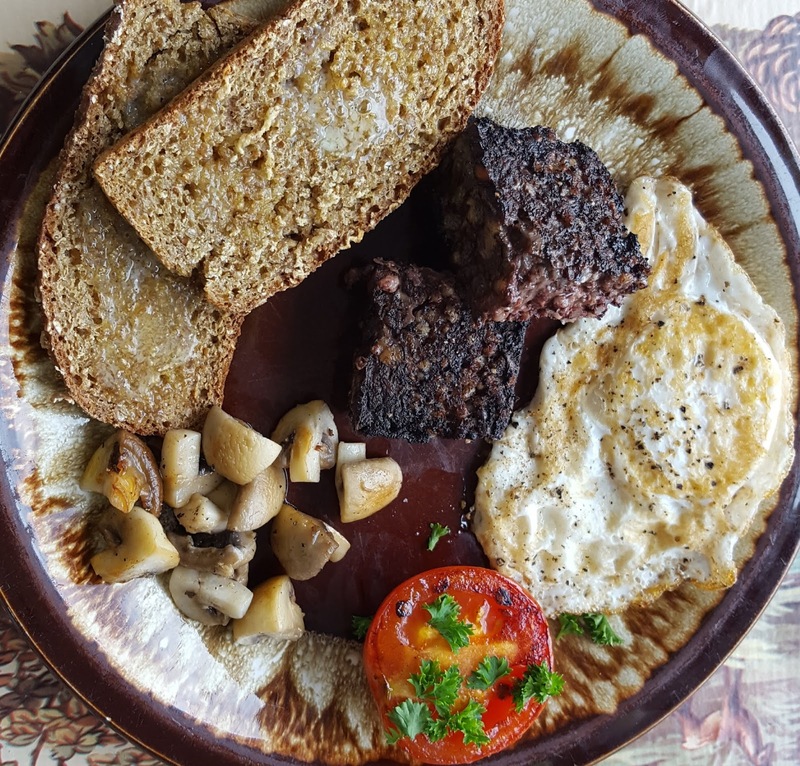 Traditionally it is served as a breakfast meat with a full Irish breakfast. I also want to try a Scotch Egg with the Blood Pudding. I know this may not be for everyone, but once you get beyond the concept of "blood" it's really tastey and nutritious! ALL FOR TODAY. TOMORROW IS MY BIRTHDAY AND THE MAKING OF THIS BLOOD PUDDING AND WRITING ABOUT IT WAS TRULY MY PRESENT TO ME! NEXT TIME WE'RE GOING TO DISCUSS A VERY SIMPLE RECIPE FOR MONK FISH MARSALA. MONK FISH IS CAUGHT RIGHT OUTSIDE OUR DOOR SO AS FRESH AS FRESH CAN BE! 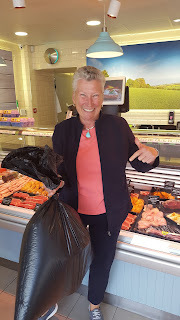 The other day I bought some beautiful salmon filets from my favorite fish market--Ali's Fish, in Barna, which is a couple villages east of Spiddal. Eddie Toner holding a large wild salmon. Eddie is from the Claddagh in Galway. The Claddagh, which means "the shore", is located on the western side of Galway situated at the mouth of the Corrib River. Once a thriving fishing village dating from the 5th century, this village was the heart of Galway's fishing community. This is also the "town" behind the ring. Eddie cutting some wild salmon steaks. Tomorrrow nights dinner! 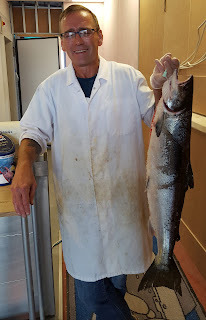 The farm raised salmon (in the case) is much paler in color than the wild. 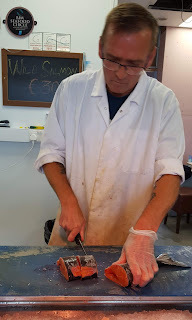 I asked Eddie where the salmon came from and he said Irish Organic Salmon Company, Clare Island, County Mayo. There is much controversy over fish farms in Ireland as every year farmed salmon escape into the rivers and breed with the wild salmon. Last fall it was reported that hundreds of farmed salmon escaped into 5 different rivers in the west of Ireland causing much ecological havoc. 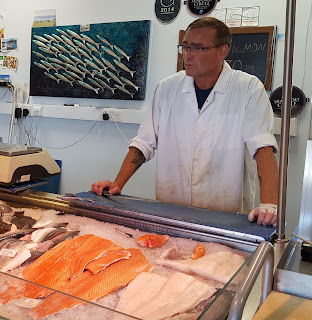 I have to believe many fish farms raise salmon sustainably and responsibly, although some say with the increase of fish farms there is no longer any such thing as a wild salmon in Ireland, or maybe anywhere in the world. But this salmon was fresh, firm, sweet and made a lovely cake. As you can see the main ingredient is salmon. 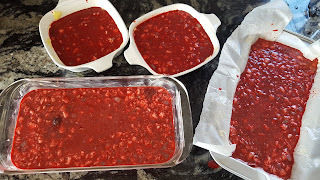 Mix all together and serve the cakes with a dollop of sauce. 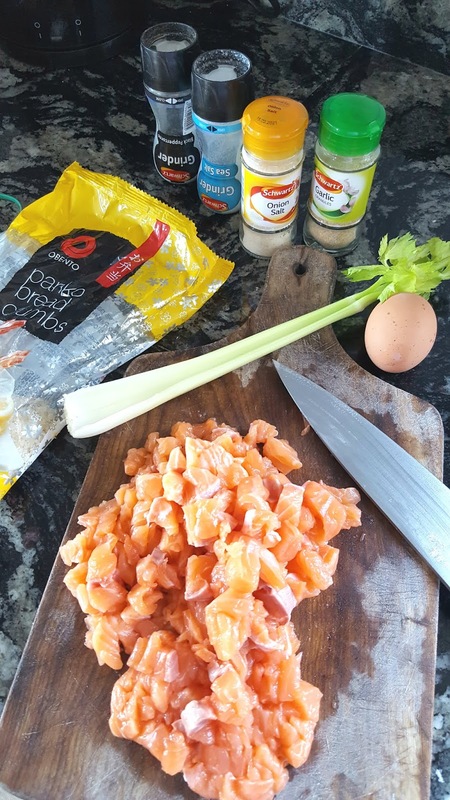 Roughly dice the salmon filets. Liberally salt and pepper. Add all other ingredients except Panko (for coating) and olive oil (for frying) and gently mix until well incorporated. Form into 4 generous cakes. They will be a little loose, but will firm up in the fridge before you saute. 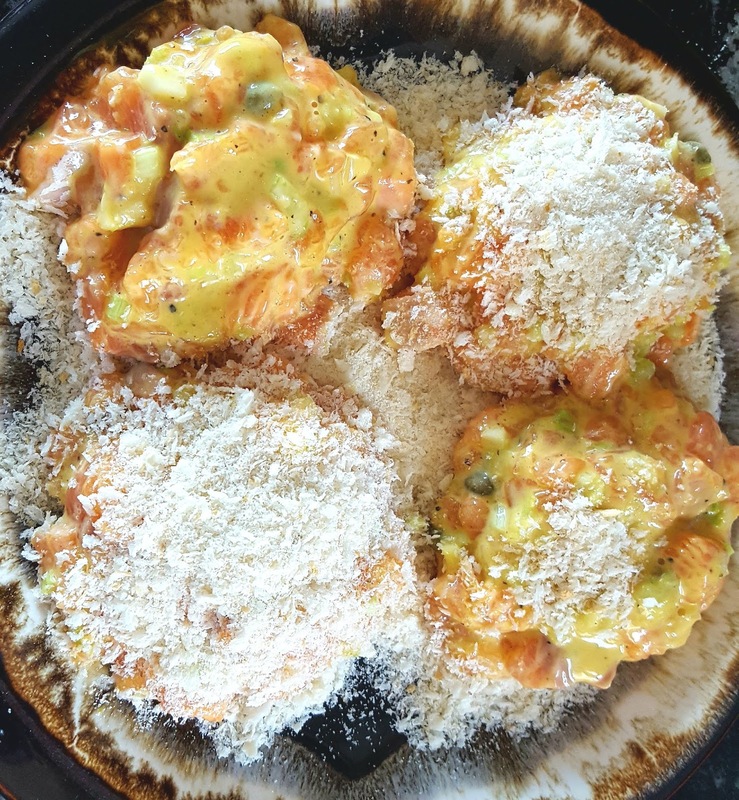 Spread about 2 cups (1/2 cup per cake) Panko bread crumbs on a plate or tray. Place the cakes on the crumbs and gentle press into the crumbs, turning to coat both top and bottom. Add more crumbs if necessary. Cover with plastic wrap and place in refrigerator at least an hour to firm up. These cakes can be made a day ahead. Bring to room temp before cooking. Over high heat, bring 2 Tbsp. Olive oil to the smoking point. Add cakes. Reduce heat to medium high and saute for about 6 minutes until golden. 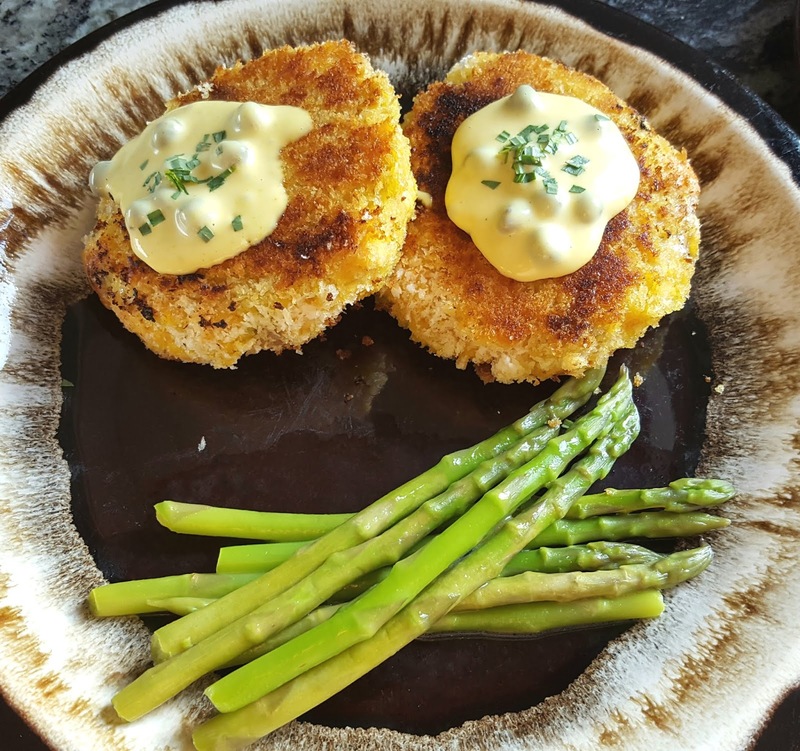 Carefully turn salmon cakes over and cook for another 6 minutes until done. Let rest in pan for 3 to 5 minutes. Serve with sauce. These would also be excellent with either Bernnaise or Hollandaise sauce. 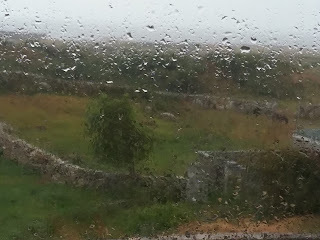 GETTING SOME MUCH NEEDED IRISH RAIN!